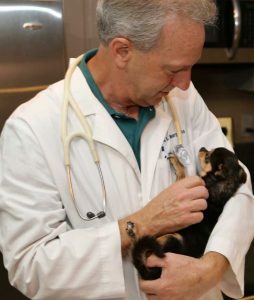 In 1983, Dr. Raymond Bourgeois moved to the New Orleans area where he worked in a veterinary clinic. He realized that many of his clients’ pets were very uncomfortable in the clinic. So, he decided to move his veterinary practice out of the clinic into the pet’s own environment at home. In 1987, Dr. Bourgeois established At Home Veterinary Care, bringing his personal care and attention to his patients. He enjoys spending time with his dog and cat patients and helping them get through their check-ups, toe-nail clipping, and more in the comfortable environment of their own homes. This At Home Veterinary service is not only beneficial to the four-legged patients but also for the pet owners because we come to you. At home Veterinary Care is a mobile veterinary care service. We can save you the cost, stress and inconveniences of transporting your pet or pets to and from a veterinarian office. Call (504) 737-1711 today to make an appointment.